Butter-less, flour-less, egg-less, and potentially sugar-less cookies? When I first read the recipe for Nikki's Healthy Cookies in 101 Cookbooks, I shared Heidi's doubts about just how good this cookie could be. 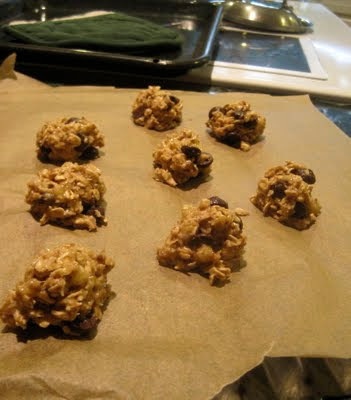 But as I read on to the ingredient list and ripe banana, ground nuts, oats, and chocolate chunks popped out, I put away my doubts and went for it. The ingredients in this cookie are so wonderfully rich in taste and texture on their own that it doesn't even need added fat or (much) sugar to taste good. Cut into irresistible bite-size chunks, the emphasis here on "healthy" does not disappoint. Yield: Makes about 3 dozen bite-sized cookies. 1 tbsp brown sugar (optional). I added sugar because I was concerned the cookie wouldn't be sweet enough without the coconut, but I don't think its a must- a less sweet cookie takes on a more earthy taste.